Dignity UltraShield Active Liner, Light/Moderate, 7-1/2" x 15-2/5". Provides a cloth-like, moisture-proof barrier and elastic side gathers for optimal comfort and protection. Incontinence Pads provide light to moderate bladder protection and are designed to fasten inside your own underwear with an adhesive strip. 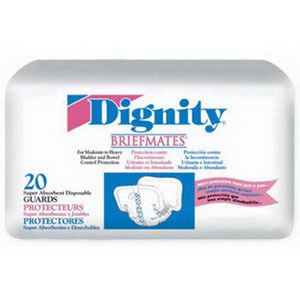 This Dignity® Pad is super-absorbent for dryness and odor control with a moisture-proof cloth-like barrier. Designed for women with light to moderate incontinence, Dignity® Super Guards is a wider and longer more protective incontinence pad, contoured for extra comfort. Peach, disposable shaped liner with an hourglass design. Super absorbent polymer for dryness and odor control. May be worn with Spartan® moisture-proof pants, mesh pants and in regular underwear.